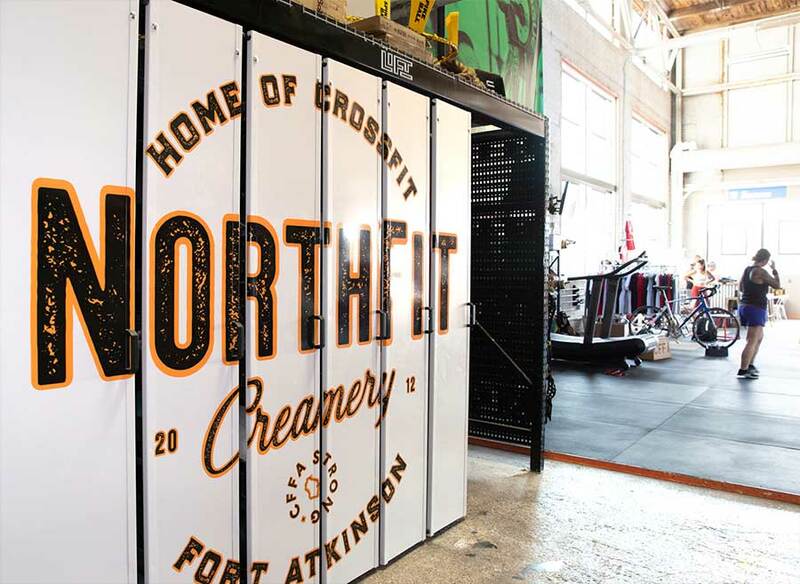 When Masters CrossFit® Athlete Jeb Simmons and his wife, Meg Zechel, moved their gym into a historic dairy processing facility in the heart of downtown Fort Atkinson, Wisconsin, they wanted to take full advantage of the opportunity to re-brand and build a showplace facility. 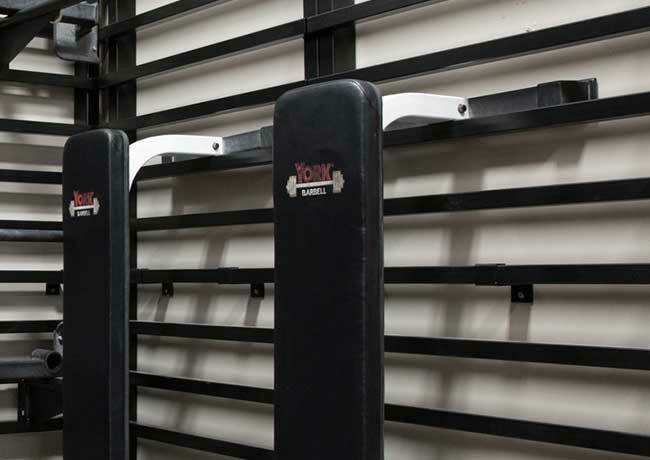 Wanting to free up more space for workouts while still preserving the open feel and function of their gym, Jeb and Meg acquired a complete LIFT solution that’s specifically designed for the unique sizes and shapes of fitness gear. 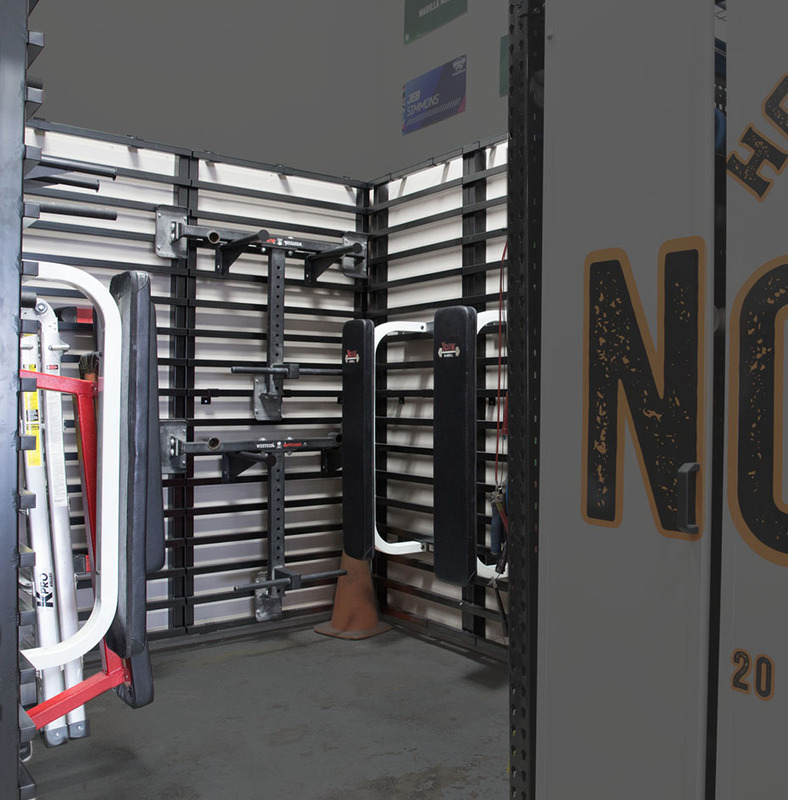 Their fitness equipment storage system has components, each designed to do a specific job. 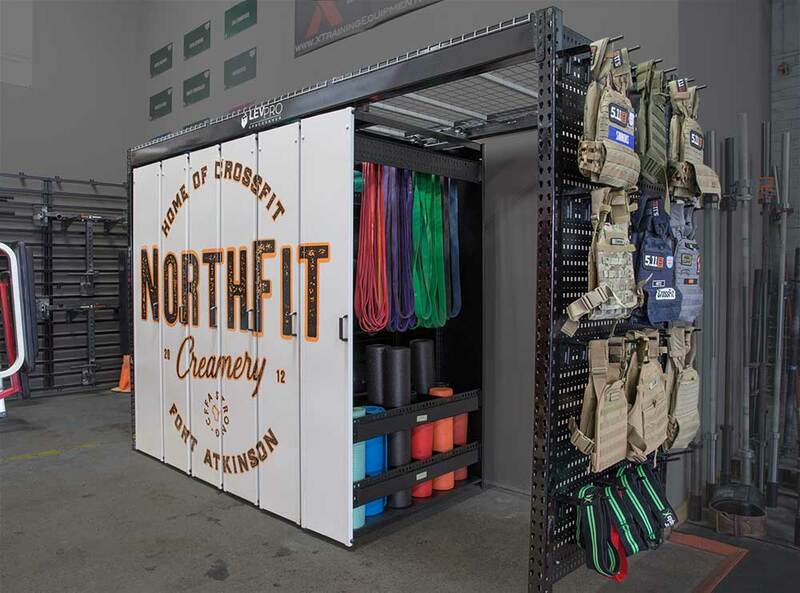 The patented LIFT Compact Shelving system efficiently holds a variety of fitness items, from weighted vests to mats and jump ropes. 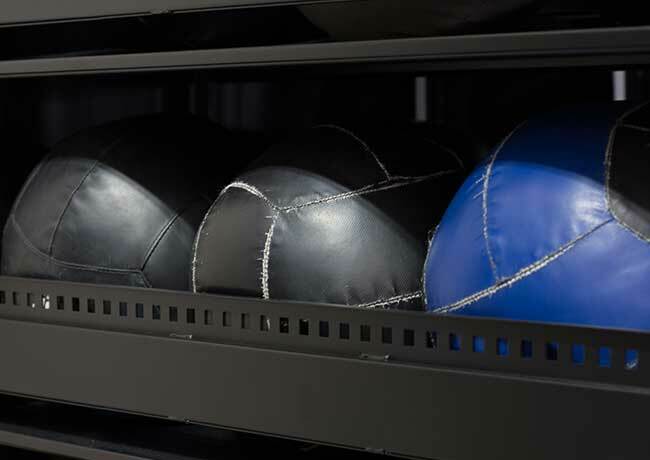 In addition to customizable storage features, this system is available in a range of colors and custom graphic options. 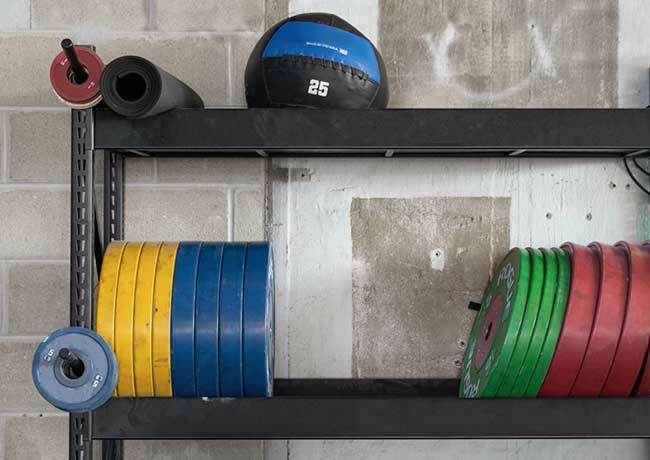 Weighted balls on tilted shelves fitted with bars in the back. Steel pegboard and sturdy pegs hang straps and jump ropes. Pads and other gear fit vertically on adjustable shelving. 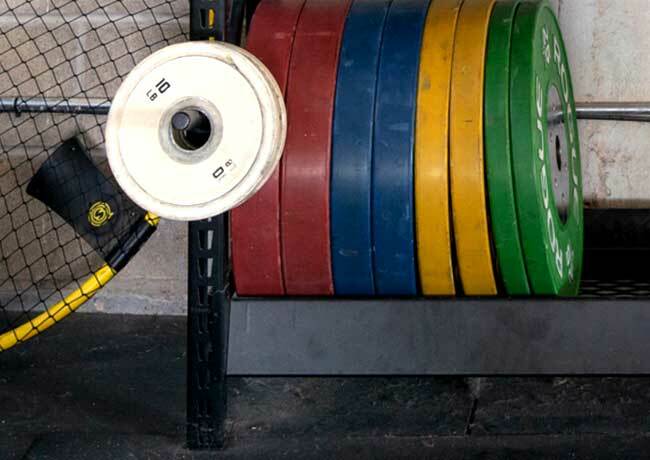 Custom configurations store mats, wall balls, and other lighter-weight items. 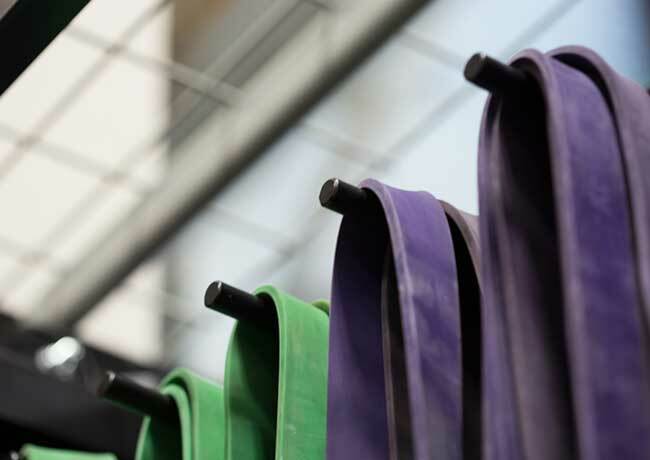 Accessories, such as sturdy heavy-duty pegs organize bands, jump ropes, weight belts, and vests. 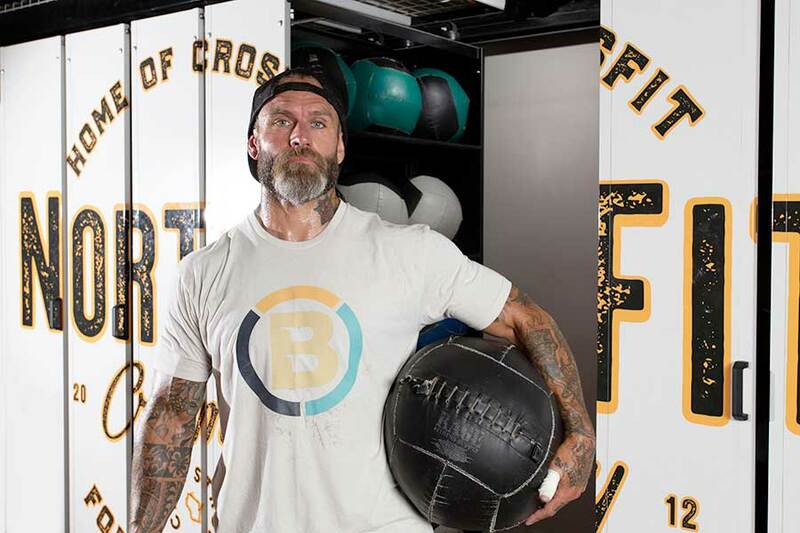 There’s room to grow as the gym’s membership expands. 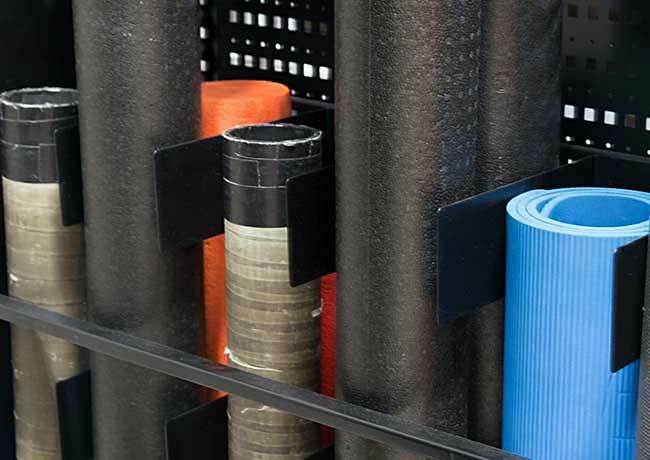 Bins hold rolled mats and foam rollers. 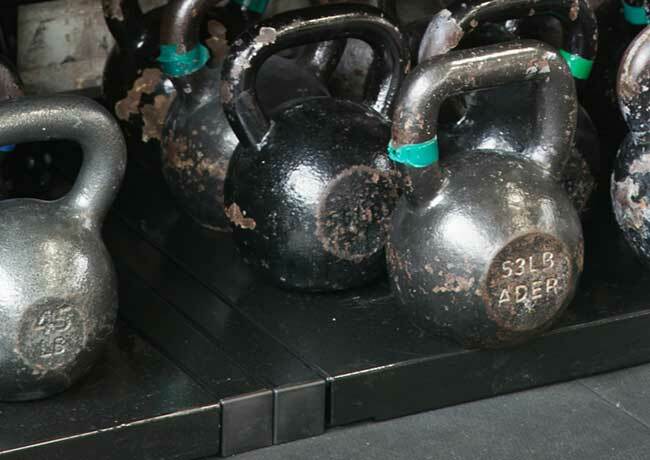 Heavier items like kettlebells, sandbags, and dumbbells need shelving that can stand up to their weight. 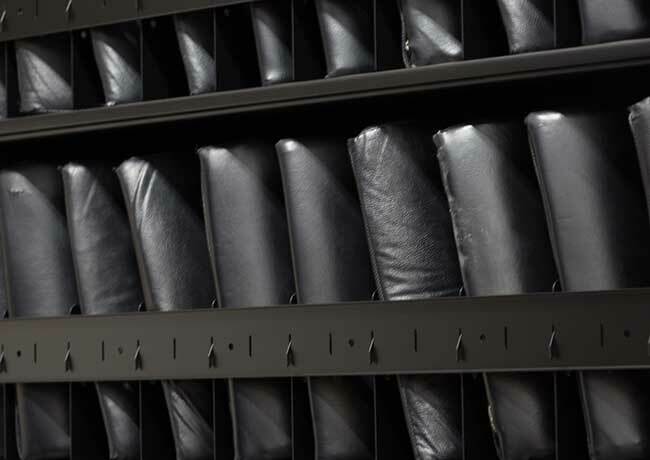 LIFT HD Shelving is designed to meet the challenge, and its textured powder-coat paint resists wear and tear. Jeb and Meg positioned several units close together, right on the perimeter of the workout area for convenient access. 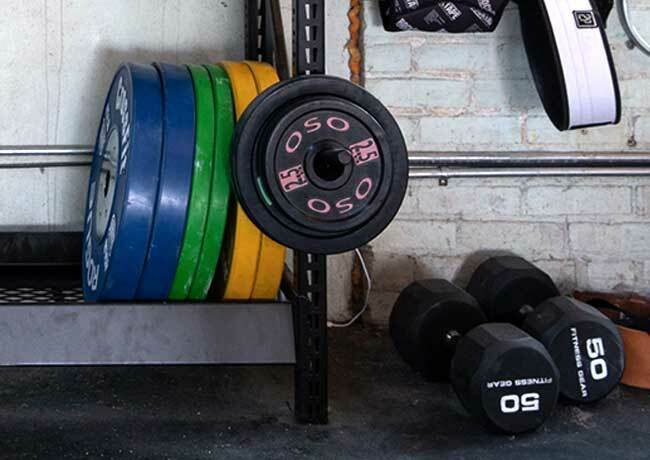 Heavy-duty shelves can hold up to 150lbs. 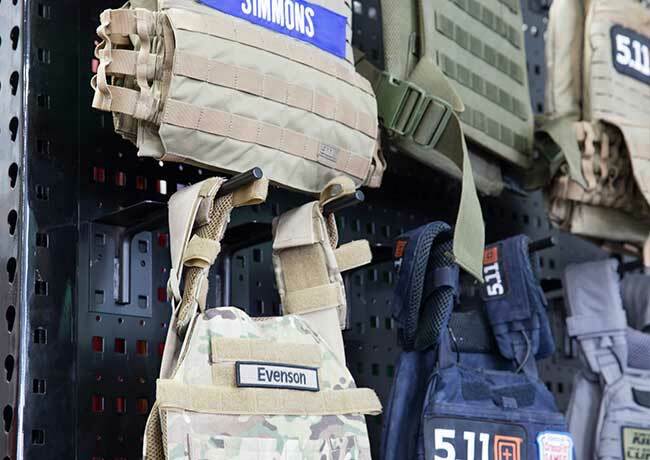 Adjustable shelves can change with equipment inventory. 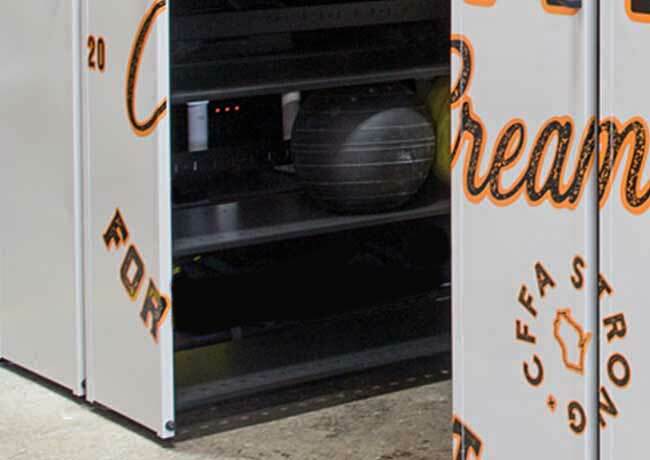 Textured powder-coat paint resists wear and tear. 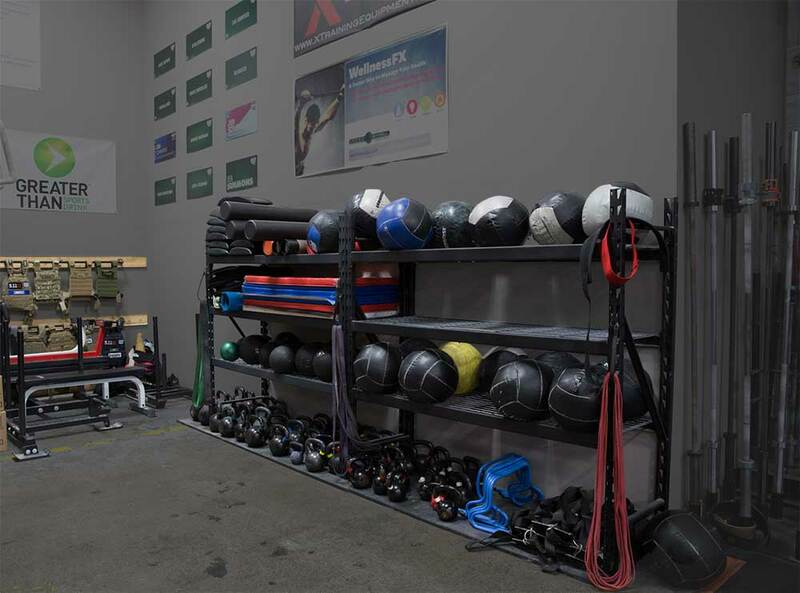 LIFT HD Wall Racks put the walls to work, getting sleds and weight benches out of the way and turning previously unused space into efficient storage. Modular units fit any space. 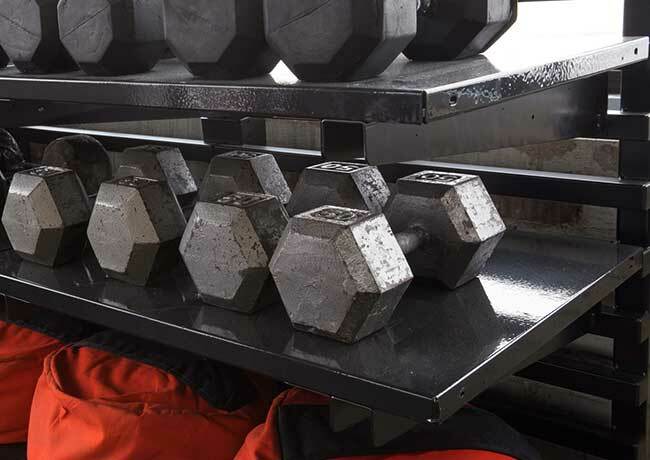 Store weight benches and sleds off the floor and out of the way. 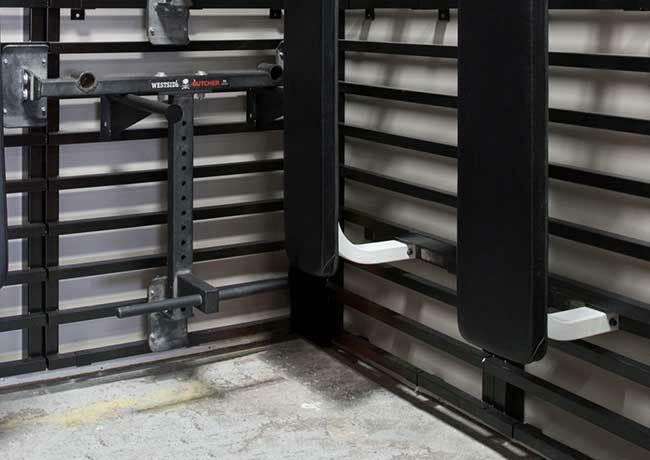 Available in various widths and heights, wall-mounted racks can fit in any space. 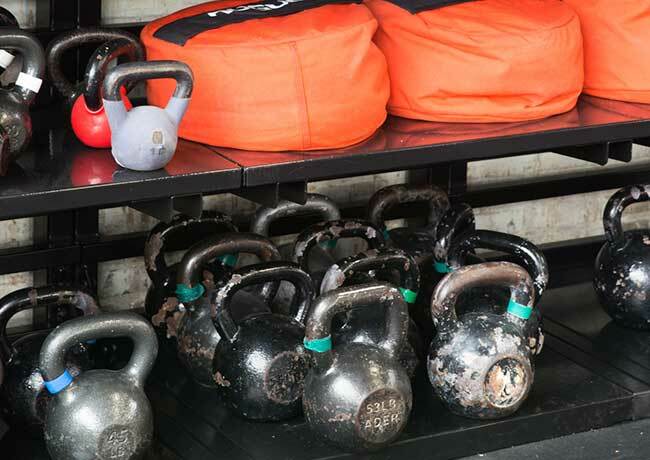 Put unused wall space to work and get gear off the floor. LIFT Plate Storage keeps plates organized. 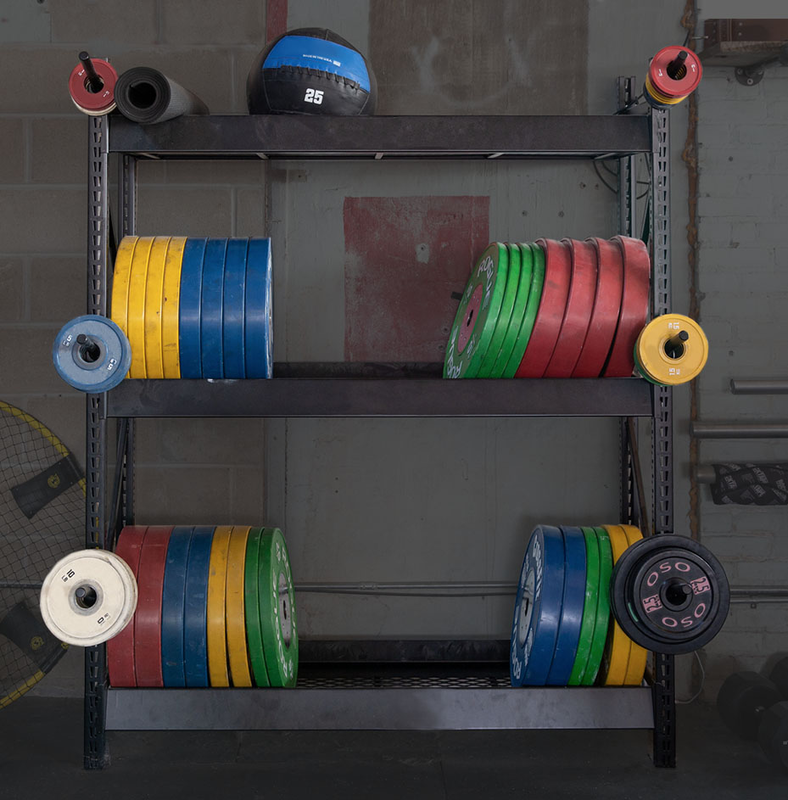 Located on the perimeter of the weightlifting area, the plate storage rack is conveniently positioned and easy to use. 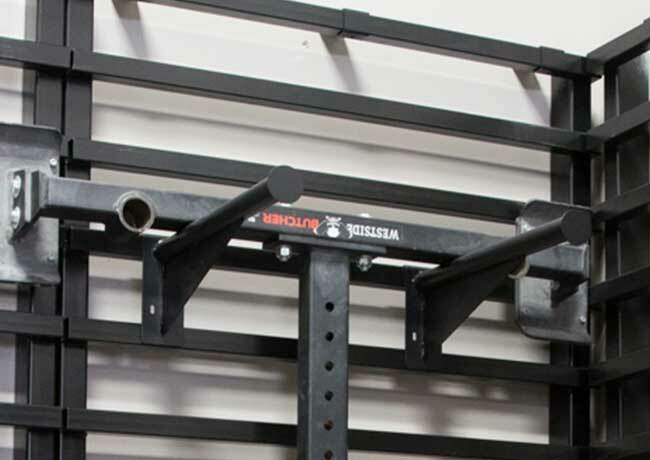 Plate storage racks have pegs for smaller weights. 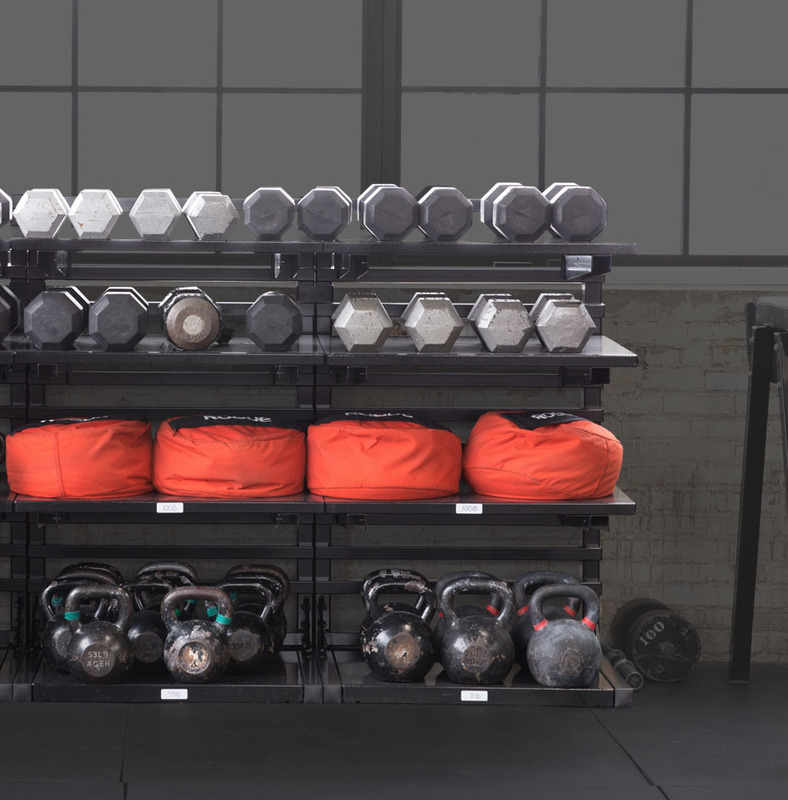 Easily adjust racking shelf heights. Optional top shelf for storing lighter-weight items. Jeb and Meg chose coordinated paint colors and graphics that perfectly fit the gym’s look and feel. The end result is an integrated solution that protects gear, keeps it organized, and is easy for everyone to use during workouts. Let’s Go. Contact us for a free consultation.